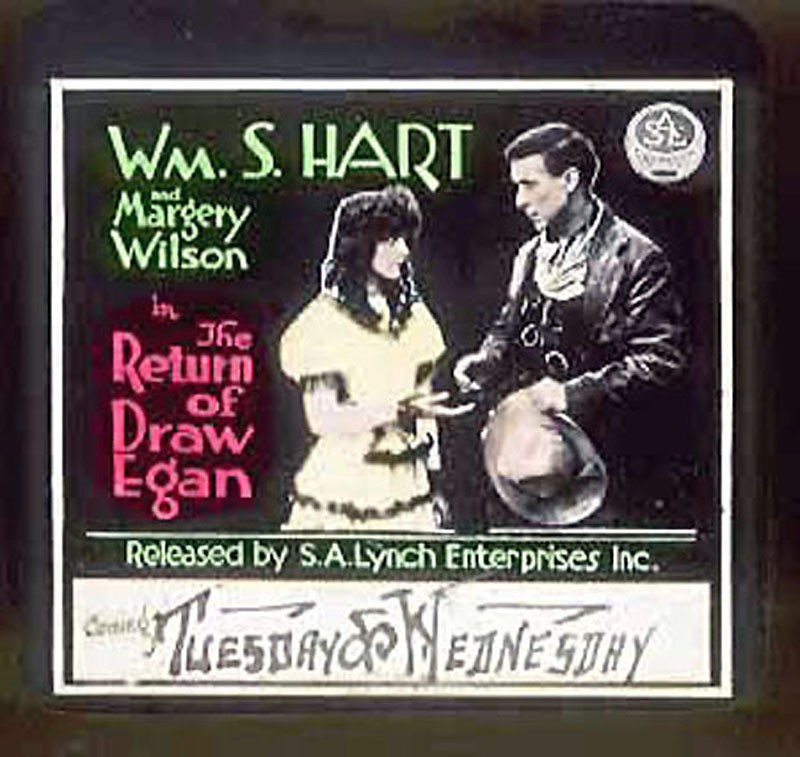 Hand-painted, 4" x 3¼" glass slide from "The Return of Draw Egan," a short Western directed by William S. Hart. Featuring Hart in the title role and Margery Wilson (as Marguery Wilson) as the love interest, it was produced by Triangle Productions and Kay-Bee, and released Oct. 1, 1916, by S.A. Lynch Enterprises, Inc. The original "trailers," painted glass slides were inserted into movie projectors and shown on the silver screen to promote coming attractions. One of Hart's many bad-man-turned-good films, "The Return of Draw Egan" is the story of a villain who is mistaken for a lawman and is thusly appointed Sheriff of the town of Yellow Dog. Given respectability, Egan (Hart) embraces the law and cleans up the town. Also appearing in the film are Louise Glaum, Robert McKim, J.P. Lockney, Dorothy Benham, Hector Dion, J.H. Gilmour, Florence La Badie, George Marlo, Samuel N. Niblack and Robert Vaughn (II). The original movie cowboy, Hart was born Dec. 6, 1864 in Newburgh, New York. He made his last film ("Tumbleweeds") in 1925, moved to Newhall in 1927 and died there on June 23, 1946. More information about Hart here.